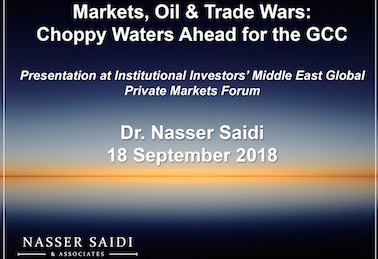 Dr. Nasser Saidi gave a closing keynote presentation titled “Markets, Oil & Trade Wars: Choppy Waters Ahead for the GCC” at the Middle East Global Private Markets Forum organised by Institutional Investor in Dubai on the 18th of September 2018. The presentation covered the global macroeconomic outlook and risks, and looked in depth at the reform and transition in the GCC given the backdrop of the New Oil Normal. The session also discussed the medium-term outlook for Saudi Arabia and GCC, and concluded with a few key takeaways.